We know operators who have run on the same zero-turn mower wheels for the full life of their mowers, but if you’re lucky enough to own a ZTR Bad Boy, you know that just like they do on your car, your mower’s tires and wheels can wear out a little faster. If you’re regularly mowing over hazardous obstacles or making frequent turns on top of abrasive surfaces like asphalt, you might suffer the occasional leaking tire or warped wheel. Keep in mind that your deck wheels can wear out too due to scratches or damage from rocks and tree stumps. We carry complete assemblies and parts sold separately so you can fix what needs fixing and leave the rest alone. Check our product descriptions for appropriate sizing and Bad Boy model compatibility. All zero-turn mower wheels, tires, and replacement parts are original equipment manufactured for total reliability. 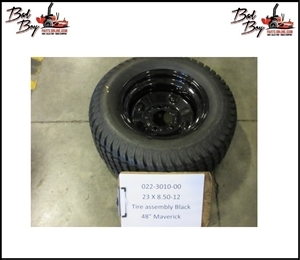 Wheel for Tire Size 22x11-10. Bad Boy Part# 022-2014-00 or 022201400. 23 x 10.50 -12 Assembly w/Nega. Bad Boy Part# 022-5460-00 or 022546000. 24 x 12.00 - 10 Tire and Wheel. Bad Boy Part# 022-4000-00 or 022400000. 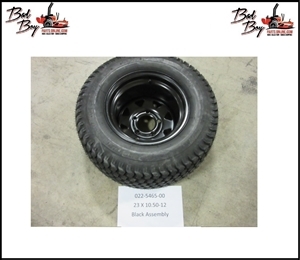 26 x 12.00 - 12 Tire and Orange Wheel Assembly. Bad Boy Part# 022-7031-00 or 022703100.